Sealed tenders are invited in three parts (Part-I Cost of Tender Documents & Earnest Money, Part-II Techno Commercial Bid and Part-III Financial Bid) for the following services in PSPCL for two stage bidding process. Interested bidders may download the RFP documents containing detailed Eligibility Criteria, Terms of Reference and General terms & Conditions etc. from our website www.pspcl.in The cost of RFP/Tender document (non-refundable) of Rs. 2,500/- (Two thousand Five hundred only) in the form of demand draft in favour of “Accounts Officer/Cash, PSPCL, payable at Patiala should be submitted along with the bid. PSPCL will not be responsible for delay in receipt of tender(s), sent by post / courier. The same shall be opened on scheduled due date and time i.e. 10.04.2017 at 3.30 pm. Any corrigendum to this tender, if issued by PSPCL in future, shall be uploaded on the PSPCL website (www.pspcl.in)’. Therefore, the bidders are advised to keep visiting the website regularly. Sr. no. Particulars Page no. Note: 1. This Bid Document is not transferable. 2. This Bid Document is the property of PSPCL. The information contained in this Request for Proposal Document (RFP Document /Bid Document) or information provided subsequently to bidder(s) or applicants whether verbally or in documentary form by or on behalf of PSPCL, is provided to the bidder(s) on the terms and conditions set out in this RFP Document and all other terms and conditions subject to which information is provided. This RFP Document is not an agreement and is not an offer or invitation by PSPCL to any parties other than the applicants who are qualified to submit the bids (“Bidders”). The purpose of this RFP document is to provide the Bidders(s) with information to assist the formulation of their proposals. This RFP document does not claim to contain all the information each bidder may require. Each bidder should conduct its own independent investigation and analysis and is free to check the accuracy, reliability and completeness of the information in this RFP document and where necessary obtain independent information. PSPCL makes no representations or warranty and shall incur no liability under any law, statute , rules or regulations as to the accuracy, reliability or completeness of this RFP Document. PSPCL may in its absolute discretion , but without being under any obligation to do so, update, amend or supplement the information in this RFP Document. Punjab State Power Corporation Limited (PSPCL) was incorporated on 16thApril2010as wholly owned company of Government of Punjab under the Companies Act, 1956.The Certificate of commencement of Business was received on the same date from Registrar of Companies, Chandigarh. The generation and distribution businesses of the erstwhile PSEB were transferred to PSPCL. The company has also ownership interest in BBMB. The company has two subsidiaries namely Punjab Thermal Generation Ltd and Gidderbaha Power Ltd. The company also has joint venture Company named Panem Coal Mines Ltd. The company holds Business License issued by PSERC for Power and Generation of Power in Punjab. The Govt. of Punjab restructured the Punjab State Electricity Board under the provisions of the Electricity Act, 2003. In exercise of Powers conferred by Section 131,132 and 133 of the Act, the Govt. of Punjab made a scheme called the Punjab Power Sector Reforms Transfer Scheme, 2010 vide notification dated 16.04.2010 which interalia provided for transfer of functions, undertakings assets, properties, rights, liabilities, obligations, proceedings and personnel of Punjab State Electricity Board. The Scheme was subsequently amended by State Govt. by making a scheme called the Punjab Power Sector Reforms Transfer (First Amendment) Scheme, 2012 which was notified on 24.12.2012. In exercise of the powers conferred by sub clause 4 of clause 5 of the Transfer Scheme read with Section 131, 132, & 133 of the Act, the Govt. of Punjab transferred and vested distribution and generation of Power with Punjab State Power Corporation Limited (PSPCL) by way of Notifications No. 1/4/04-EB/PR/620 & 632 dated 24.12.2012 by vesting the Power undertaking with assets and liability of an aggregate value of Rs 30912. crores as on 16.04.2010 and from said date, Company is carrying on the business of generation and distribution of power in the State of Punjab . At present, there are more than 200 accounting units spread across the Head Office and other parts of Punjab. The authorized capital of the company is Rs.20,00,000/- crores and the Issued, subscribed and Paid-Up capital is Rs.6081.47 crores as on 31st march, 2016. The net worth of the company as on 31st march, 2015 is Rs 14698.17 crores. The Company has investment of Rs.5 Lakh in Punjab Thermal Generation Limited and Rs.5lakh- in Gidderbaha Power Limited as on 31st March2015and as such these companies are the subsidiaries of PSPCL and company has 130000 shares in Panem Coal Mines Ltd and with 26% voting rights. The net worth shall be calculated in accordance with the stand-alone financial statements of the company as on 31stMarch, 2015 or the first audited financial statements for accounting period which ends after that date. These accounting standards will be applicable to PSPCL from FY 2016-17 on the basis of its minimum Net worth of 500 crore. I. PSPCL intends to appoint Professional Consultant for implementation of INDIAN ACCOUNTING STANDARDS (IND AS) which is as per the guidelines issued by Ministry of Corporate Affairs India, Institute of Chartered Accountants of India (ICAI), and other applicable Statutory Regulators and as per the best Accounting Practices, to be implemented across all its units /branches/ departments of the PSPCL. II. Sealed tenders in three parts (Part-I Cost of Tender Documents & Earnest Money, Part-II Techno Commercial Bid and Part-III Financial Bid) are invited by the PSPCL from eligible firms(no consortium or subcontract shall be allowed) for assignments of Consultancy on INDIAN ACCOUNTING STANDARDS (IND AS) and implementation thereof in line with the guidelines issued from time to time by Ministry of Corporate Affairs, Institute of Chartered Accountant of India, and other applicable Statutory Regulators. III. Bidders can depute their representatives to attend the bid opening. The representative has to submit an authority letter duly signed by the bidder, authorizing him to represent and attend bid opening process on behalf of the bidder. The name of the bidders qualified under bid will be announced only after the evaluation process by the Committee constituted for this purpose. There will be a two stage bidding process i.e. Techno Commercial Bid & Financial Bid shall be submitted in three parts by the bidder. The committee constituted by the PSPCL shall scrutinize the bids to ascertain whether the bidders fulfill the eligibility criteria whose decision shall be conclusive and binding. Further the committee constituted by the PSPCL shall also evaluate the techno commercial bid and shortlist the eligible firms for opening of the financial bids. The decision of the committee shall be conclusive and binding. “REQUEST FOR PROPOSAL” (RFP) containing detailed eligibility criteria, terms of reference and general terms & conditions etc. can be downloaded from our website www.pspclinagainst non-refundable cost of Rs. 2,500/- (Two thousand five hundred only) in the form of demand draft in favour of “Accounts Officer/Cash, PSPCL, payable at Patiala. This cost for specification must be submitted in a separate envelope along with the bid failing which the bid of the firm shall not be opened. The Bidder shall be required to submit fixed Earnest Money of Rs. 2,00,000/- (Rupees Two Lakh only) in the form of demand draft favoring ‘Account Officer/Cash, Punjab State Power Corporation Limited (PSPCL), payable at Patiala along with the bid. If the Earnest money is not submitted with the bid or is not found in order, the Techno Commercialbid will not be opened and the bid will be rejected out rightly. The offer will be valid for 120 days from the opening of bid. A bid valid for shorter period shall be rejected by the PSPCL as non-responsive. Any decision in this regard by the PSPCL shall be final, conclusive and binding on the bidder. At any time before the submission of proposal, the PSPCL may at its discretion, amend the RFP including extension of the deadline for the submission of proposals . Any such amendment will be notified on the website of the PSPCL and will be binding on all the bidders. PSPCL reserves the right to reject any or all the tenders without assigning any reason and no claim on this account shall be acceptable. The bid documents can be downloaded from 10.03.2017& bids should be submitted in sealed cover and delivered at the address given below latest by 10.04.2017 up to 3.00 P.M. which shall be opened on the same date at 3.30 P.M. In case the due date of tender opening happens to be holiday, tenders shall be received and opened at the same time and place on the next working day. The documents for the Cost of Tender Documents, EMD, and Techno Commercial bids will be opened at 3.30 PM on 10.04.2017 at the address given below in the presence of authorized representatives of the bidders, who may like to attend. The part III i.e. financial bid of only those bidders shall be opened who are eligible on the basis of qualifying criteria and are techno commercially suitable. The date and time for opening of part III of the bids will be intimated to the qualifying firms. i. As contained in the Techno Commercial Bid checklist mentioned at Clause 5 of Part-3 of General Terms and Conditions of this document below. ii. Financial Bid as perAnnexure-N as mentioned in clause 6 of part 3 of General Terms and Conditions of this document belowin the bidding document. iii. The bidders shall submit documentary evidence in Techno Commercial Bid to establish that the bidders meet the Qualifications Requirements/Criteria as spell out under bidder’s eligibility criteria. iv. The Cost of Tender Documents and Earnest Money Deposit (EMD) is to be submitted as per clause 4& 5 above. v. The copy of documentary evidence as required in the eligibility criteria on or before the date of opening of Techno Commercial Bid. vi. A declaration that the Firm accepts all terms & conditions mentioned in the RFP without any alteration and deviation. 9. Any other Information/details required in this regard can be had from the office of undersigned or from website www.pspcl .i n.
To give a detail presentation of the changes required, overview of work plan, implementation road map and the key areas of attention to the management. To conduct impact study and identify the key accounting issues/areas (including first time adoption issues) along with key differences between accounting policies (regarding the recognition, measurement, disclosure etc. ), and financial statement presentations as per Local GAAP (Accounting Standards) and IND AS emerges for the preparation of financial statement of PSPCL as per IND AS notified by Ministry of Corporate Affairs and finalize necessary changes required for smooth preparation of financial statements as per IND AS requirement. To Visit the Field offices of PSPCL for understanding the accounting work. Submit a comprehensive ‘Report’ with the details of work done at the end of Phase 1, to the satisfaction of the PSPCL. After identification of key differences between PSPCL’s existing accounting policies, disclosures, and financial statement presentations as per Local GAAP and IND AS, formulate and suggest the revised accounting policies (including recognition, measurement etc.) as per IND AS and to document the necessary adjustments/gaps arising after identification of key differences. Also develop necessary templates. ii) the significant accounting policies. iii). the presentation structure of financial statements and grouping of account codes as per Accounts Manual and suggest all other changes to make it IND AS compliant. The Consultant need to review our practice with reference to valuation of inventory specially Meters accounting, borrowing cost, Fixed Asset (useful life and residual value), depreciation & any other field that consultant may deem necessary. The consultant shall measure the fair value of all the assets and liabilities of PSPCL to make it IND AS compliant. Submit a comprehensive ‘Report’ with the details of work done at the end of Phase, 2 to the satisfaction of the PSPCL. Conversion and preparation of IND AS compliant opening Balance Sheet as at April 1, 2015, along with statement of change in equity, notes including disclosures and rel atedreconci li ation statements. Conversion and preparation of IND AS compliant Financial Statements for the Year ending March 31, 2016, along with statement of change in equity, notes including disclosures and related reconciliation statements. The consultant would also be required to give a certificate towards IND A Scompl i ant Financial Statements. To assist PSPCL at the time of Statutory Audit/Supplementary Audit by C&AG ofIndia during the course of audit on IND AS related issues. To review and provide qualitative information to the PSPCL required for the purposeof preparation of Annual Report for the year ending March 31, 2017. The Consultant shall provide necessary support for implementation of any changestill finalisation/adoption of accounts of FY 2016-17 in the AGM (including anyqueries on the same) limited to amendment/changes impacting accounts of 2016- 17. Consultant will provide all other related clarifications/guidance, inputs etc. as andwhen required, if any, for smooth implementation of IND AS in PSPCL. To execute the said assignment the consultant may require tovisit substationsand other offices/accounting units of PSPCL for discussion and collection ofdata. > Identification of training needs. > Development of training calendar. > Development of training materials,presentations, case studies, examples etc. > Deliver IND AS training on various changes and updations. The Consultant to provide adequate handholding to the PSPCL officers/officials on IND AS reporting requirements and the financial accounting/reporting process to enable PSPCL officers/officials to prepare IND AS compliant financial statements in subsequent years. Assess implementation and provide guidance on new items and implement improvements, and suggest system specifications, if any. Note:-Apart from above scope of work, from time to time, the consultant shall also complete works required to make PSPCL’s financial statements IND AS compliant. 1. The following instructions must be carefully observed by all bidders to ensure submission of complete and comprehensive bid. Quotations/bids not strictly in accordance with these instructions will be liable to be rejected. i. The bid must be complete in all respects. Failure to comply with any of these instructions or to offer brief explanation for non-compliance is likely to render effective comparison of the tender as a whole impossible and may lead to rejection of an otherwise competitive lowest offer. Further before submission of the bid, the bidders are required to make themselves fully conversant with the eligibility criteria, scope of work, payment and penalty clause, general terms & conditions etc. ii. The bids shall be submitted in Triplicate and all copies shall be separately tagged, serially numbered and marked as Original/Duplicate/Triplicate as the case may be. iii. The bid shall be submitted in three parts i.e. Part-I, Part-II & Part-III. Each part will be enclosed in a separate envelope duly super-scribed on the envelope as under. All the three envelopes will be further enclosed in a larger envelope. The following procedure will be adopted for the opening of bids. a) Part-I Cost of Tender Documents & Earnest Money: The first part will consist of Cost of Tender Documents & Earnest Money in the form of Demand Drafts in favour of “Accounts Officer/Cash, PSPCL”, payable at Patiala. b) Part-II Techno Commercial bid: The second part will consist of documentary evidence with regard to qualifying criteria and other documents as mentioned in this RFP. c) Part-III Financial Bid: The third part will consist of the financial bid. d) The bidder shall supply a list of authorized person(s) with their signatures duly attested on the firm’s pad so that they may represent on behalf of the firm and participate in the opening process of the bid. The firm shall supply one such copy in the bid in the larger envelope and one copy should be with the authorized person otherwise he will not be allowed to participate in the opening of bid. e) The bidder revising their offer or withdrawing the same within the validity period after opening of the bids are liable to be ignored/black listed. Firstly the larger envelope containing the bids will be opened in the presence of the bidders/representatives, who choose to be present at the time, date and at the prescribed address. After opening the larger envelope, the envelope marked Part-I (Cost of Tender Documents & Earnest Money) shall be opened first and if the cost of tender documents & earnest money found to be as per the requirement, only then the envelope marked Part-II (Techno Commercial Bid) will be opened. The bids without earnest money and cost of tender documents shall be out rightly rejected. After opening Part-II of the bids (Techno Commercial bid), the bids will be technically & commercially evaluated by the committee constituted by PSPCL. The Part-III will be opened in respect of those bidders who are short listed on the basis of qualifying criteria and evaluation done by PSPCL as mentioned in Part-II. The date and time for opening Part-III of the bids will be intimated to the eligible/shortlisted firms. The financial bids (Part-III) will be opened in the presence of the representative of the eligible bidders who choose to be present. PSPCL reserves the right to modify specifications at any time and to reject any or all the bids received without assigning any reasons. It will not be responsible for and will not pay for expenses or losses that may be incurred by the bidders in the preparation of the bids. Bids shall be received in the office of Dy. 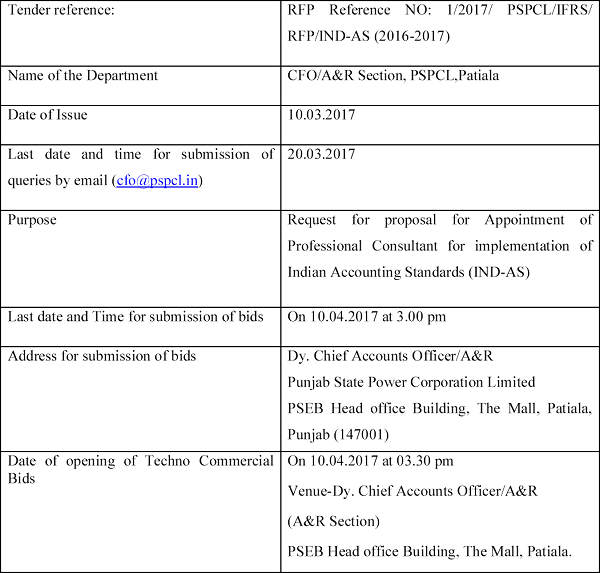 Chief Accounts Officer/A&R, PSEB Head office Building, The Mall, PSPCL, Patiala-147001 upto specified hours on thedue date given in the bid notice and shall be opened at the fixed hours in the presence of bidders or their representatives who may like to be present. In case the due date of receiving/opening of bids happens to be a holiday, bids shall be received and opened at the same time & place on the next working day. Covering letter as per Annexure-A. Proposal form as per Annexure-B of this document. Bidder/Firm’s Profile along with documentary evidence as per Annexure-C. Details of other information with relevant documents as list out in eligibility requirements/criteria as per Annexures–D, E, F, G, H, I, J & K.
List of the key professionals and the support staff along with their CV for each phase of the assignment Annexure-L & M.
Duly signed authority letter by the competent authority of the firm. Authorizing the executants to sign the bid on behalf of the firm. Note: Techno Commercial Bid shall not include any information regarding Financial Bid. A Techno Commercial Bid containing information on the Financial Bid shall be declared invalid and be rejected. i) The Financial bid should be strictly submitted in the format given by PSPCL as per Annexure -N and should not have any deviations, restrictive statements etc. therein otherwise such bid is liable to be rejected at the sole discretion of PSPCL. The bid must be inclusive of all expenses (like remuneration to staff, accommodation expenses, travelling expenses etc.) & any other taxes excluding Service Tax which should be shown separately as prevalent at the time of submission of bid. However the same will be paid at the rate as may be actually prevalent at the time of payment within contractual completion period. ii) Bidders should quote FIRM prices only. iii) The rate quoted should be given in figures and words and any overwriting, erasion, cutting etc. should be avoided or legibly signed. During evaluation of bids, if found necessary, PSPCL may seek clarification of the bid from the bidder. The request for clarification and the response shall be in writing. During the course of consultant’s work, the Consultant is to make his best effort to work in harmony with others in the best overall interest of the PSPCL and comply with PSPCL instructions for making alternative arrangements at any time for maintaining the work scheduled at no extra cost to the PSPCL. The consultant shall not assign or transfer the Contract or any part thereof, any share, or interest there-in to any other person. The consultant shall provide the suitable substitutes having the requisite qualification and experience in case of resignation etc. by any official deputed for the work. i) The key persons identified for the project shall carry out their activities from PSPCL’s The personnel involved for executing the assignment should be qualified as per the requirements mentioned in the Qualification Criteria and preferably should have been involved in a similar assignment. ii) The Consultant selected for the assignment should adhere to the Quality Standards, regulatory directions, guidelines in this regard. 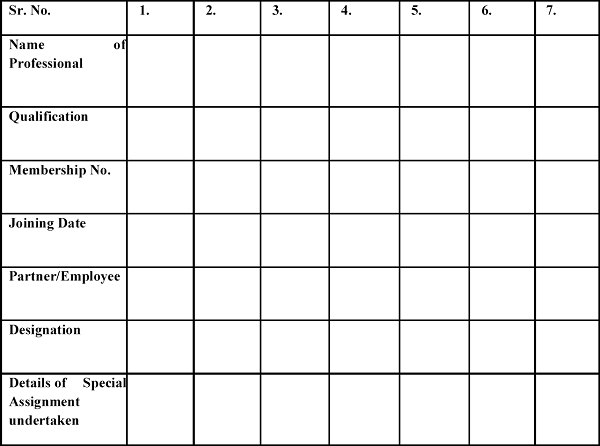 iii) The Consultant selected for the assignment should treat as confidential all data and information about the PSPCL obtained in the execution of the proposed assignment, hold it in strict confidence and should not reveal such data /information to any other party without the prior written approval of PSPCL. iv) The proposal should be submitted strictly in the formats provided in this RFP However any additional information can also be provided if required by the bidder. v) The proposal should be free of overwriting/corrections/alterations. vi) The proposals and related Annexures should be signed by the authorized signatory of the Consultant. The executant’s authority to represent and bind the Consulting Firm must be confirmed by a written authority letter issued by the Competent Authority of the Consultant accompanying the proposal. vii) It is hereby clarified that the bid/response to the RFP should be submitted in the exact format given herein without making any changes/alterations to the RFP document. Any change/alteration made to the RFP document by the participant would make the respective Bid/response to the RFP void and the same shall be liable to be rejected by the PSPCL without further going into the merits of the tender. It is also clarified that in case of any difference/change between Bid/response to the RFP document submitted by the participant and the RFP document maintained by PSPCL, the RFP document maintained at the PSPCL, would be considered as authentic and binding on the participant. The bidder must submit unconditional and unambiguous compliance confirmation to all the terms and conditions stipulated in the RFP. The consultant shall conform to the provision of any Statute relating to the work and regulations and bylaws of any local authority and of any Central/State Departments or Undertakings with whose system the work is proposed to be connected. Consultant shall be bound to give notice required by Statue Regulations or Bylaws and to pay all fees and taxes payable to any authority in respect thereof. In case of any change in the constitution of the firm and contact details the same shall be forthwith notified by the consultant to the PSPCL for its information. Any change in the address of the consultant shall also be intimated to the PSPCL. i) The successful bidder shall be required to submit security deposit for faithful execution of the work order/contract at the rate of five percent (5%) of value of work No interest shall be payable to the consultant on the amount of security. Earnest Money received with the bid shall be converted into security deposit and the balance, if any shall be deposited in the form of demand draft in favour of “Accounts Officer/Cash, PSPCL, payable at Patiala. ii) The security deposit of the consultant shall be released by PSPCL within six months from the date of faithful execution of work order/contract in all respect. In the event of default on the part of consultant in faithful execution of work order/contract, security deposit shall be forfeited by PSPCL. The forfeiture of security deposit shall be without prejudice to any other rights arising or accruing to the PSPCL under relevant provisions of contract like penalty/damages for delay or risk execution of work including suspension of business dealings with PSPCL for a specific period. ii) For any delay in work on account of act of omission or commission on the part of the PSPCL, only extension of time will be agreed for the period so lost and no compensation would be given on this account. During the pendency of the Contract, if the performance in whole/part by either party or any obligation there under is prevented/delayed by causes arising out of any war, hostility, civil commotion, acts of the public enemy, sabotage, fire, floods, explosions, epidemics or under order/instructions of Central/State Government/PSERC Regulations, strikes lockout, embargo, acts of Civil/Military authorities or any other causes beyond their reasonable control, neither of the two parties shall be made liable for loss or damages due to delay or failure to perform the contract during the currency of Force Majeure conditions, provided that the happening is notified in writing (with documentary proof) within 30 days from the date of the occurrence. Any excess payment made to the consultant inadvertently or otherwise under this contract or on any account whatsoever and any other sum found to be due to PSPCL by the consultant in respect of this contract or any other contracts of work order or on any account whatsoever may be deducted from any sum whatsoever payable by the PSPCL to the consultant either in respect of this contract or any work order of consultant from any other account by any other office of the PSPCL. In case of negligence on the part of consultant to execute the order/contract with due diligence and expedition and to comply with any reasonable orders given in writing by the Consultant in connection with the Contract or any contravention in the provisions of the contract, the client may give 21 days notice in writing to Consultant to make good the failure or neglect or any Contravention and if the consultant fails to comply with the notice within time considered to be reasonable by the client, he will suspend/terminate business dealings with the consultant for a specific period apart from claiming reasonable compensation/damages, forfeiture of security etc. The PSPCL reserves the right to cancel the work order as a whole or in part at any time without assigning any reason or in the event of default on the part of the consultant. i) Consultant shall Indemnify PSPCL against any liability or damages by way of compensation arising from any accident to person or property of persons in the consultant’s employment. ii) Consultant shall Indemnify PSPCL against any liability or damages by way of compensation arising from any accident to any other person related to or unrelated to consultant or PSPCL. iii) Consultant shall bear the entire responsibility, liability and risk relating to coverage of its workforce deputed on said assignment under different statutory regulations including but not limited to Workmen Compensation Act, ESI Act, Factories Act, Contract Labour Act 1970 etc. and other relevant regulations, as the case may be. iv) Consultant shall be fully responsible for payment of benefits to its workforce deputed on said assignment including but not limited to Provident Fund, Bonus, Retrenchment Compensation, Leave Encashment, etc. as per statutory provisions. v) Necessary payment and liabilities as mentioned at (i to iv.) above shall be the responsibility of consultant irrespective of payment received from PSPCL or otherwise. vi) All taxes and other levies payable to government and or local authorities in respect of these works shall be the responsibility of the consultant. i) If at any time any question of dispute or difference what so ever shall arise, between the PSPCL and the Consultant upon or in relation to or in connection with work order/contract, either party may forthwith give to the other notice in writing of the existing of such question, dispute or difference and the same shall be referred for sole arbitration of a nominee of the PSPCL who shall give a reasoned/speaking award. The award of the sole arbitrator shall be final and binding on the parties under the provisions of the Indian Arbitration Act 1996 and of the rules there under. Any statutory amendment, modification or re-enactment thereof for the time being in force, shall be deemed to apply and be incorporated in the contract/work order. The Sole Arbitrator shall be any officer of the PSPCL whose name is approved by theCMD of the PSPCL. It will not be objectionable if the Sole Arbitrator is an officer of the PSPCL and he has expressed his views on all or any of the matter in question of dispute or difference. ii) Upon every or any such reference, the cost of and incidental to the reference and award respectively shall be in the discretion of the Sole Arbitrator so appointed who may determine the amount thereof or direct the same to be fixed as between solicitor and client or as between party and shall direct by whom and to whom and in what manner the same is to be borne and paid. iii) The work under the contract shall, if reasonably possible continue during the arbitration proceedings and no payment due or payable by the PSPCL shall be withheld on account of such proceedings. i) If the firm or any partner thereof shall at any time be adjudged bankrupt or have a receiving order or order for administration of his Estate made against him or shall take any proceedings for liquidation or composition under any Bankruptcy Act for the time being in force or make any conveyance or assignment of its/effect of composition or arrangement for the benefit of his creditor or purport to do so, or if any application he made under any Bankruptcy Act for the time being in force the sequence of his Estate or if a trust deed granted by him on behalf of his creditors. ii) Assigns transfers, sub contract or attempts to assign, transfer or sub contract any portion of the work. If at any time after the acceptance of the bid, PSPCL shall, for any reason whatsoever, not requires the whole or any part of the work, to be carried out, the PSPCL shall give notice in writing to the fact to the consultant who shall have no claim to any payment of compensation or otherwise on account of any profit or advantage which he might have derived from the execution of the work in full but which he did not derive in consequences of the foreclosing of the work. He shall be paid at contract rates, for the full amount of the work executed including such additional works, as may be rendered necessary. The consultant shall not have any claim for compensation on account of any alterations having been made in the original specifications and instructions involving any curtailment of the work as originally contemplated. The bidders will have to give an undertaking that they shall not pay any commission etc. or engage any commission agent or liaison agent for dealing with PSPCL in any matter. This undertaking is required to be supplied along with the documents to be supplied in Part-II of the tender, failing which their offer/tender is likely to be ignored. No advance payment shall be made to the firm and all payment of installments as mentioned above will be released after deducting TDS and other taxes/statutory dues as applicable at the time of payment. Reject the proposals received in response to the RFP containing any deviation from the payment terms stipulated in Point No 26 above. Extend the time for submission of proposal. Modify the RFP document before submission of bids, by an amendment that would be notified on the PSPCL’s website. To independently ascertain information from other institutions/companies to which the bidder has already extended IND AS services for similar assignment. Modify the time period stipulated in Point No.26 above for completion of assignment during the execution of assignment if it deems fit. With respect to all the term & conditions of the Agreement, the bidder shall include its personnel, employees, consultants, and / or other authorized persons. In no event shall the bidder be liable for claims arising from or in connection with the sole negligence or misconduct of the party seeking indemnification. The selected bidder has to execute a Deed of Indemnity for this purpose. This document contains confidential and proprietary information of the PSPCL. Further, the bidder will be exposed by virtue of the assignment, to the internal business and accounts related information of the PSPCL. Accordingly, the selected bidder will have to sign a legal non-disclosure agreement in the prescribed format. a) Unnecessary or unwarranted delay in execution of the work allotted. b) Delay in providing the requisite manpower at the PSPCL’s site. c) Delay in submission of reports beyond the stipulated periods. d) Breach of trust is noticed during any stage of the consultancy assignment. e) Assigns transfer, sublet or attempts to assign transfer or sublet any portion of the work order. In addition to the termination of order, PSPCL reserves the right to deduct/ adjust the damages/penalty from the earnest money deposit (EMD) given by the bidder&further forfeit Security deposit given by the bidder. On termination of contract PSPCL may entrust the work to any firm at the risk and cost of the bidder. Any publicity by the bidder in which the name of PSPCL is to be used should be done only with the explicitly written permission of PSPCL. The time allowed for carrying out the work as prescribed, shall be strictly observed by the consultant and shall be reckoned from the date of commencement of work. The work shall throughout the stipulated period of the contract be proceeded with all the due diligence (time being deemed to be the essence of the contract on the part of the consultant) and the consultant shall pay as penalty an amount equal to half percent (0.5%) per week for delay in the work of each phase (on the amount payable for that phase) after the date of completion of that phase, provided that the entire amount of compensation to be paid under the provision of this clause shall not exceed ten percent (10%) of the total fee payable. Acceptance of the bid proposal by PSPCL shall be communicated to the successful bidder by issue of Letter of award.The successful bidder shall deposit the balance security, if any, along with acceptance of letter of award within five days.Thereafter, the detailed work order shall be issued as per terms & conditions which shall itself form valid contract along with subsequent amendment, if any, and shall be construed and operated as such in terms for of Indian Contract Act, 1872 as amended upto date. The date of commencement of assignment shall be the date of issue of work order by PSPCL. The period of contract agreement shall expire upon successful completion of assignment. It will be obligatory on the part of the successful bidder to execute within 15 days of the receipt of the detailed work order, a legal contract agreement on judicial stamp paper(Annexure-O) of appropriate value. The signatory on behalf of successful bidder shall also supply the Power of Attorney in his favour duly attested by Notary Public. Two copies of contact will be executed between the PSPCL and Consultant. One copy duly executed will be returned to the consultant. If the work entrusted is not proper and to the satisfaction of PSPCL, then the payment will not be released and if the work of the consultants continues to be unsatisfactory, the agreement shall be terminated by PSPCL by 10 daysnotice at any time during subsistence of this agreement. The same will be entrusted to another consultant and the extra expenditure incurred by PSPCL will have to be borne by the consultants. Jurisdiction for filling any suit in case of any dispute shall be the Civil Courts at Patiala. 38. All other term & conditions as per Works Regulation of PSPCL (as amended up to date) shall be applicable. Sub: Your RFP for implementation of Indian Accounting Standards (IND AS), as per the guidelines issued by Ministry of Corporate Affairs, India, Institute of Chartered Accountants of India (ICAI) and other applicable Statutory Regulators. With reference to your RFP No ……………. dated …………………, we have examined and understood the qualifications, terms of reference, terms and conditions etc. forming part of the RFP. We hereby enclose our offer to provide our services for implementation of IND ASas detailed in your above referred RFP. We agree to all the terms and conditions mentioned in the RFP. We are hereby submitting our bid which includes cost of tender documents, earnest money, techno commercial bid, and a financial bid sealed under separate envelopes. If negotiations are held during the period of validity of the bid, i.e., before [Date] we undertake to negotiate. Our offer is binding upon us and subject to the modifications resulting from contract negotiations. We understand, you are not bound to accept any offer you receive. Having examined your RFP Document, we, the undersigned, offer our services to provide consultancy services for implementation of Indian Accounting Standards (IND AS) of the PSPCL in conformity with the requirements mentioned in said RFP documents. We undertake, to carry out the work as per the scope of work, deliverables and in accordance with the time schedule specified in the RFP document as well as on the terms of payment mentioned therein. We confirm that the information submitted by us in our bid/offer is true and correct. We agree to abide by the bid/offer. We hereby acknowledge and unconditionally accept that the PSPCL may on its absolute discretion apply whatever criteria deemed appropriate in short listing and selection of the consultants. We declare that we have not made any alterations/changes whatsoever in the RFP document and we are fully aware that in the event of any change, the RFP document maintained at the PSPCL will be treated as authentic and binding and the bid/proposal submitted by us will be liable to be rejected by the PSPCL in the event of any alteration made in the RFP document. We declare we shall not pay any commission etc. or engage any commission agent or liaison agent for dealing with PSPCL in any matter. We certify that there has been no conviction by a Court of Law or contemplated by court for misconduct, guilty or Indictment/adverse order by a regulatory authority for a offence against us or any of our sister concern and if it arises we will intimate the PSPCL of the same. We undertake that, in competing for and, if the award is made to us, in executing the above contract, we will strictly observe the laws against fraud and corruption in force in India namely“Prevention of Corruption Act, 1988”. We understand that you are not bound to accept the lowest, or any other offer, you may receive. Note: Any additional information about bidder’s profile can also be added by bidder. List of Professionals having experience in IFRS/IAS/IND AS field. Note: a.) Requisite documents should be attached in support of above along with self-declarations as per eligibility criteria. b.) Separate sheets may be attached if required. Particulars of Implementation of IFRS/IND AS or Implementing IND AS. b.) In case of IFRS/IAS, copies of satisfactory performance/completion of services from the clients. c.) Audited P&L a/c of clients in support of meeting turnover criteria of the client. d.) Separate Sheet may be enclosed if required. Particulars of Clientele of big Industries including Reputed Private and PSUs. a.) Copy of Work order/Letter of engagements as Auditor of the Company. b.) Audited P&L a/c of client in support of meeting turnover criteria of the client. c.) Separate Sheet may be enclosed if required. With reference to your RFP no. Dated for Appointment of Professional Consultant for Implementation of Indian Accounting Standards (IND AS), I/we declare that the firm/any partner of the firm have not been involved in any scam/financial irregularities, nor there is/are any disciplinary proceedings against us/them. I/We hereby agree that any misrepresentation or concealment of facts in this undertaking may lead to our disqualification for the said assignment. Annual Turnover of the Firm for the preceding previous three years. Note: Audited Balance Sheet and P&L a/c of the Firm in support of meeting turnover criteria. With reference to your RFP no. Dated for Appointment of Professional Consultant for Implementation of Indian Accounting Standards (IND AS), I/we declare that I/we have not been banned or de-listed/Debarred or blacklisted by any PSU/Government Department/Financial Institution/Professional body/Court and no case is pending with the police/court against our firm/partner or the company in professional capacity. With reference to your RFP no. Dated for Appointment of Professional Consultant for Implementation of Indian Accounting Standards (IND AS), I/we undertake that we the firm will not sub-contract/outsource the order and will not engage any other firm on commission basis. I/We hereby agree that any misinterpretation or concealment of facts in this undertaking may lead to our disqualification. I/We, hereby certify that all the information and data furnished by me/us with regard to this RFP No …………. dated …………….. are true and complete to the best of my/our knowledge. I/We have gone through the specification, conditions and stipulations in detail and agree to comply with the requirements and intent of specification. I/We, do hereby also declare that during the tenure of IND AS implementation in the PSPCL, guideline issued by ICAI/Ministry of Corporate Affairs from time to time shall be automatically applicable to the contract to the extent they improve upon the stipulation of this tender fromPSPCL‟s view. I/We also undertake to maintain confidentiality of documents & information which shall be used during the execution of the Contract and the documents & information shall not be revealed to or shared with third party which shall not be in the business interest of PSPCL. I, the undersigned, certify that to the best of my knowledge and belief, these data correctly describe me, my qualifications, and my experience. Subject: Consultancy Services for Implementation of INDIAN ACCOUNTING STANDARDS (IND AS) – Financial Bid. We, the undersigned, offer to provide the consulting services as per your terms of reference for the above in accordance with your RFP No. and our offer/bid dated…… Our financial bid is inclusive of all expenses (like remuneration to staff, accommodation expenses, travelling expenses etc.) & any other taxes except Service Tax. Our financial bid shall be binding upon us subject to the modifications resulting from contract negotiations, up to expiration of the validity period of the bid, i.e., 120 days from the opening date or up to any further extension given thereafter. 1. The above quoted fee is for all the phases as laid out under scope of work. 2. We undertake to deliver all the deliverables in time as mentioned in scope of work of the document. 3. Service Tax as applicable at the time of payment shall also be paid. 4. PSPCL will deduct Income Tax as source (TDS) while releasing payment, if applicable as per the law. We understand you are not bound to accept our offer. This contract agreement made this …………… day of …………. in the year ……………….. between the Punjab State Power Corporation Limited, Patiala hereinafter called “Owner” and M/s ……………………. having their Regd. Office at ……………………… hereinafter called “Consultant” for implementation of IND AS‟ in accordance with Owner’s RFPNo ……………………… dated ………………… and Consultants offer/bid No………….. Dated……………. This is in confirmation of the advance acceptance notified in the owner letter No …………………… dated…………….. wherein the Owner has accepted the offer/bid of the Consultant for the consultancy for implementation of IND AS as per Work Order No …………… dated……………. In view of the foregoing the owner and the consultant have agreed to the scope of work and the terms and conditions of the order settled between them. The NIT/Tender Specification, the consultant offer/bid and related correspondence and the work order acknowledge/accepted (with amendment thereof) by the consultant form part of this agreement. In witness whereof the parties here to have affixed their signature on the day, month and year written as above.